Solid Classic Wood The Acoustic Solid Classic Wood is designed for those ..
Vinyl means a smooth warm tune, resonating gracefully as it spins. To create this delicacy in soun..
Clearaudio Concept MC Turntable Complete with Clearaudio Verify Tonearm and Classics Moving Coil ..
KLASSIK DD-60FV 氣浮真空吸附轉盤 KLASSIK DD-60FV 真空吸盤氣浮唱盤圖紙設計已經全部完成，核心部件的真空氣浮唱盤軸承樣件完成製作。樣件.. This is a modern turntable designed in a classic turntable style with the emphasis on providin..
Stabi Ref was first introduced in 1992. This is constructed from two plates, each plate being mad..
Our aim was simple, ie. to spin the record in the nearest possible way to the master and to en..
It’s only natural to use the word “Studio” in the name of one of our turntables, as doing so brings .. The word “Ultra” is synonymous with Mobile Fidelity Sound Lab's philosophy. It represents our extrem.. Hold your breath. Drop the needle. Enjoy analog as it’s meant to be heard. 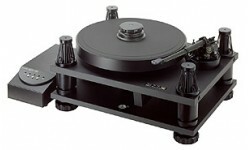 The TN-300 is a belt..
Turntable with Air Technology by TechDAS Real significance and spirit of ultimate analog play.. Fully automatic plug-and play turntable The TD 158 is a complete and comfortable record player. P..
Not just for beginners The well crafted, fully automatic TD 170-1 comes equipped with three speed..
Not just for beginners The TD 190-2 is the big brother of the TD 170-1. Plinth and platter have m..
A new reference for the entry level The TD 203 is a high quality out of the box solution from THO..
A musical family The TD 206 and TD 209 turntables are the younger siblings of the revolutionary, ..
Timeless elegance High-quality materials, a classic design and love for details are the distincti..
An elegant classic In the TD 295 MK IV, technical finesse and first-rate sound go hand in hand wi..
New standards in analogue replay. The TD 309 sets new standards in analogue replay. The turntable.. Tradition und Moderne The TD 350 revives the legendary Thorens tradition and concept of the suspe.. The musical experience The front panel of the TD 550, which also holds the operational buttons, i.. The Amadeus was our first and original design that featured the now quite famous and innovative “gol.. The epitome of William Firebaugh’s creative genius. A stripped-down version of the renowned Amadeus,..
A multi-layer “Baltic” plywood plinth finished with a walnut veneer top surface. Baltic plywood is d..